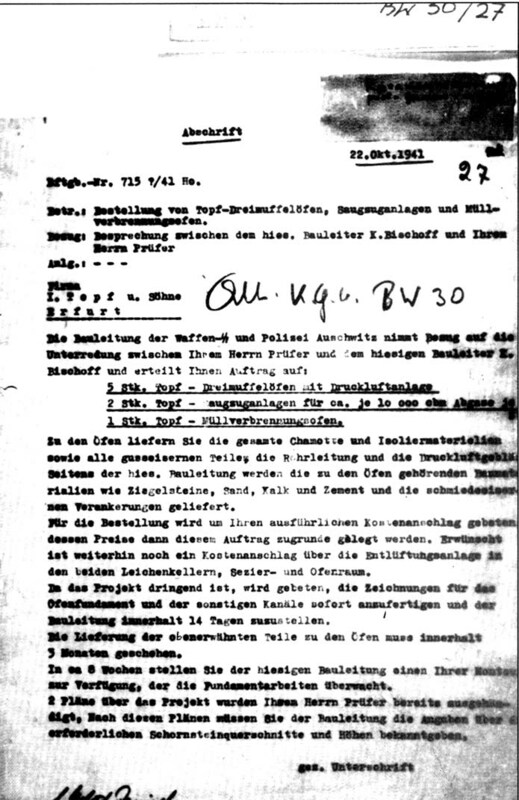 At the beginning of July 1942, the Bauleitung invited two building firms already working on the construction of the POW camp, Huta [Document 10] and Lenz & Co [Document 11], both of Kattowitz, to tender for the construction of the shell of ONE crematorium (the future Krematorium II) at Birkenau [Document 12]. On 13th July 1942, Huta submitted its tender at a price of 133,756.65 Reichsmark, a price which was to undergo several modifications (described in detail below). On 15th July, Lenz & Co refused to tender on the grounds of labor shortage. On 17th and 18th July 1942, Reichsführer Himmler visited the Auschwitz Birkenau complex for the second time. On the 17th he witnessed the complete process of a “Sonderaktion/ special action” [Document 12/II] on a Jewish convoy; he saw the detraining, the gassing of the latter in Bunker 2 and the removal of their bodies which were then buried in mass graves. In recognition of his untiring activity in the development of the camps, SS Major Hoess was promoted to Lieutenant Colonel. Hoess was in luck, for only five days after Himmler's departure he had to decree, by Kommandanturbefehl 19/42 of 23rd July, a state “Lagersperre / isolation of the camp” because of an outbreak of typhus. Disinfection and delousing measures were stepped up. On 29th July 1942, the Bauleitung awarded Huta a contract worth 133,756.65 RM for building the shell of the new crematorium at Birkenau [Document 13]. Two mirror-image buildings were in fact constructed, but no known document mentions a second order or its date. Huta themselves were to prepare the site and erect the shell of the building: brickwork, facings, floors, concrete and reinforced concrete, for 116,366 65 RM while the damp proofing work was subcontracted to Vedag at a price of 17,390 RM. The Huta price amounted to scarcely more than one fifth of the total price of a crematorium: Krematorium III cost 554,500 RM and Krematorium II probably 646,000 RM before inspection [BW 30/43, page 29]). Other contracts were subsequently awarded: construction of two chimneys (Messrs Robert Kochler); supply of ten incineration furnaces, the ventilation systems and two corpse lifts (Messrs Topf & Sons, who received 110,000 RM per crematorium); design of the roof frame (Messrs Konrad Segnitz) before supply and erection of roof frames and covering (Industrie Bau AG, who invoiced those of Krematorium III at 9,418.04 RM); drainage work (Messrs Karl Falck) [see list of enterprises in annex]. Subject: Order for Topf 3 muffle furnaces, [suction type] forced drought installation and waste incinerator. Reference: Conversation between our Head of Construction, K Bischoff and your Herr Prufer. With the furnaces you are to supply all the refractory and insulating materials as well as all cast iron parts, ducting and pulsed-air blowers. For its part our Construction Management will supply the construction materials necessary for the furnaces, such as bricks, sand, lime and cement and the cast iron anchors. For this order we request a detailed estimate, the prices on which will serve as a basis for the contract. We should also like to have an estimate for air extraction installations for the two corpse cellars. the dissecting room and the furnace room. As this project is urgent, we would ask you to immediately establish the plans for the furnace foundations and the various flues and to submit these to the Construction Management within 14 days. Delivery of the above mentioned furnace components shall be within 3 months. Within about 8 weeks you are to make available to our Construction Management one of your fitters, who will supervise the construction of the foundations. Two drawings concerning this project have already been given to your Herr Prufer. On the basis of these drawings you are to furnish the Construction Management with data regarding the required chimney section and height.